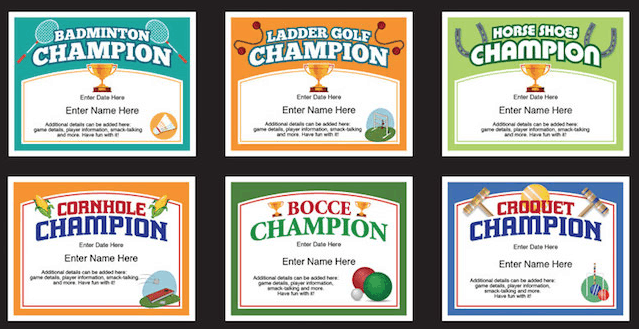 Backyard Games Certificates Templates – Who is the bocce champion of your neighborhood? Who is the croquet champ of your family? For these fun backyard games and others, now you can recognize the winner with a spiffy certificate personalized with their name and the date of the competition. Plus, add some other points to make the certificate memorable. The certificates serve as the champ’s belt. Award these throughout the year or on an annual basis. Winners can frame the certificates, or hang them on bulletin boards, refrigerators or cubicles. Make an award ceremony out of the presentation to the winners. It all adds up to more fun for your family, friends or neighborhood event. With purchase, you’ll receive a link that will enable you to instantly download the PDF file featuring these 6 backyard games certificates. PDFs work on Macs and PCs. Just make sure you have the latest version of Adobe Reader (which is available for free). If you’re on a Mac, open Adobe Reader first and then go to the certificate bundle (otherwise, the default reader is preview). These certificate templates are a great way to share some fun and put smiles on faces. Use them year-after-year and make your race recognition stand out. When’s the best time to award these certificates? Immediately following the event is one option. Or, perhaps you have a series of competitions and wait to make all of the award presentations at one time. The choice is up to you. 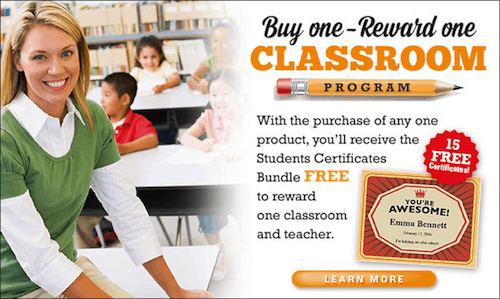 Purchase the Backyard Games Certificates Templates, and receive the Classroom Bundle FREE!